I am at a complete loss right now and I hope someone is able to help me out. I have got a new computer and reinstalled DVD profiler on it, somehow I messed up with making back-up's because I could only find a really old one. My android version is still up to date so I used that one to synchronize. I don't think that worked because my "owned" collection is empty, the number is zero. I do have 2088 DVD's/Blu Ray's in the "all" collection and they are divided into several personalized collections. When I add new Blu Ray's to my collection I first place them in the "ordered" collection and will place them into the proper personalized collection when I have added my own high resolution cover scans. 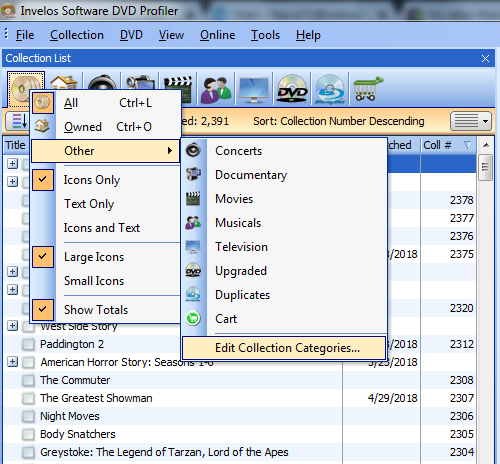 On my old computer the new Blu Ray got a collection number automatically but on my new computer that doesn't happen anymore. I can't add a collection number manually either. I can't re-number my entire collection either because the "owned" collection is empty. Everything seems to be connected to the "owned" collection that is missing. 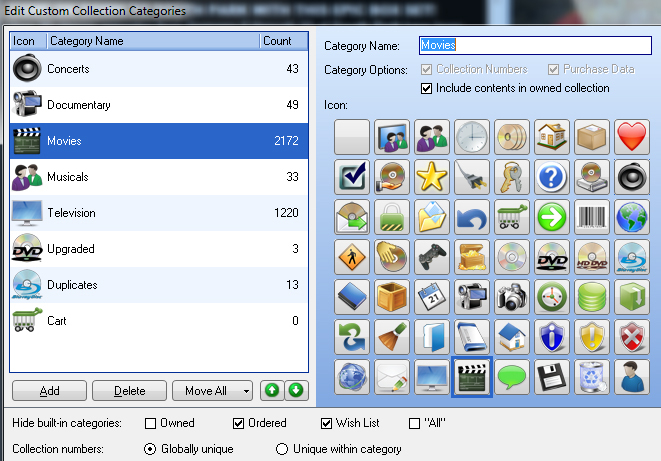 Look over how the options are set under your Collection Categories. Do you utilize the online collection at all? You can download and get your collection back that way if Lowpro's suggestion doesn't help. You don't say, but is your old computer still working/available to you? You could try making another backup and switch it over. Thanks a million LJG , your suggestion worked its magic. I never thought I could still make the correct back-up of the version on my old computer. I made the correct back-up this time and was able to restore it onto my new computer, everything is back to normal. PS. Thanks to Lowpro for his suggestion as well .